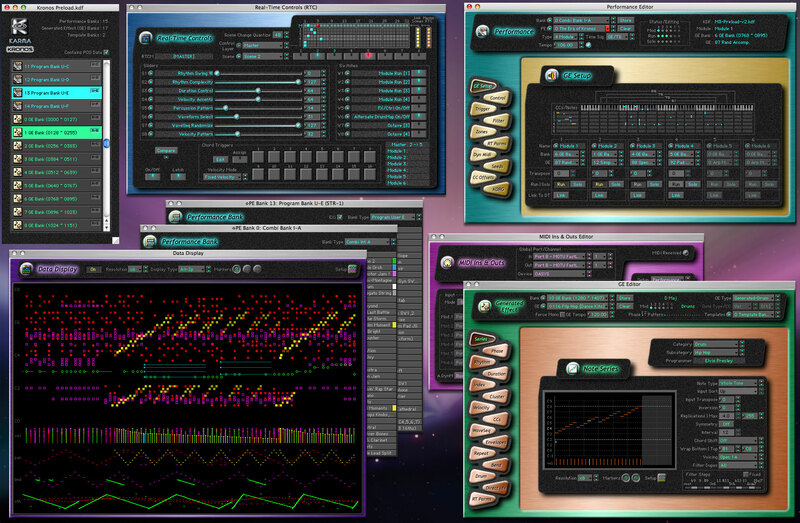 Karma Kronos is a Macintosh editing environment for KARMA, and for in depth controls of the Karma functionality of the Korg Kronos. Karma Kronos will allow you to gain complete access and control over your Karma Midi creation and the Karma features of your Korg Kronos keyboard. With this installed, you can manipulatethe 400+ parameters of a GE(Generated Effects), which even the keyboard itself cannot accomplish on it's own. You can also use the Karma Kronos to facilitate Program/Combi parameters related to the KARMA Function. The Karma Kronos is actually the same programming tool that Korg usef. It will allow you to create new GEs, or manage and edit existing GEs. This will give you almost unlimited music palette potential. The new GEs that you create or edit is easily stored on your computer or you can also send them to the keyboard's memory. With the Karma Kronos, you may create GEs by simply setting up parameters that worked well. You can also import loops, phrases or sequences of notes from the keyboard's internal sequencer, or even from an external sequencer, for instant GEs. Karma Kronos is also an audio visualizer, with it's help, you can visualize your Karma edits real time, this will help reduce the learning curve.